The upper illustration shows single-channel sampling mode. In this mode a single channel is sampled, either once or repeatedly with regular timing. The middle illustration shows multi-channel round robin sampling. In this mode multiple channels are being sampled in a rotating sequence. One channel is sampled on each A/D trigger. This is a simple way to manage multi-channel applications and is typical of a lower-end A/D board. Note that the sample rate for each channel is equal to the A/D clock rate divided by the number of channels being sampled. You must take this ratio into account when determining your sample rate. Also remember to make sure that the number of samples you take is equal to a multiple of the number of channels being sampled. The lower illustration shows multi-channel scan sampling. In this mode multiple channels are sampled in quick succession on each A/D trigger. The channels being sampled are determined during the board setup or in the software driver function call. 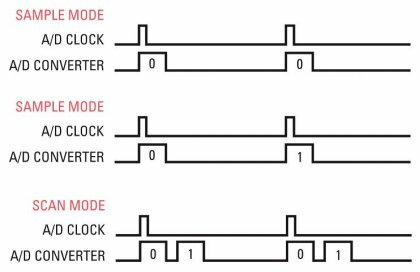 Usually any sequential group of channels can be set up for scan mode, for example channels 0-1, 0-15, or 3-9. This is a more advanced architecture that simplifies application development since it eliminates having to worry about whether the number of A/D clocks or number of samples taken is a multiple of the number of channels being sampled.